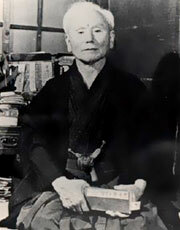 The Father of Modern Karate, Funakoshi Gichin was born on Nov 10, 1868 in Yamakawa, Shuri, Okinawa Prefecture. He was of samurai lineage, from a family which in former times had been vassals of Ryukyu Dynasty nobles. As over the years he pursued his training and continuously developed his remarkable skills, Master Funakoshi became chairman of the Okinawa Martial Arts Society, as well as an instructor at the Okinawa Teacher’s School. Then in 1922, when he was 54 years old, he introduced Okinawan karate-jutsu at the first Ministry of Education (now Ministry of Education, Science, Sports, and Culture) – sponsored Physical Education Exhibition. This introduction, the first ever public display ofkarate-jutsu in Japan, was a stunning success. And the previously unknown martial artist Funakoshi Gichin rose to instant fame throughout the Japanese world of martial arts. Immediately the founder of modern judo, Kano Jigoro, invited Master Funakoshi and his pupil Gima Shinkin to the Kodokan judo dojo to give a demonstration of kata. The highly attended event filled the Kodokan dojo to capacity. It was so well received that Master Funakoshi found himself pressed on all sides to stay in Tokyo. Excited by the opportunity to further promote the martial art that he had done so much to introduce to Japan, Master Funakoshi subsequently began teaching it at Tokyo’s Meiseijuku, a dormitory for Okinawan students there. In 1922, he published a book entitled “Ryukyu KempoKarate.” It was the first formal exposition in Japan on the art of karate-jutsu. Not only were its contents fresh and novel, it was also beautifully written, and immediately created an unprecedented karate boom. 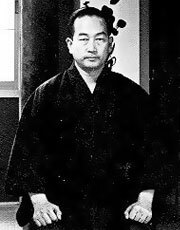 Around the same time, with the encouragement of his teacher of Buddhism, Abbot Furukawa Gyodo of Enkakuji Temple in Kamakura, Master Funakoshi started practicing Zen. He contemplated the well known Buddhist teaching that says “form is emptiness and emptiness is form.” He began to see the relevance of that teaching to his martial art, and ultimately changed the characters for karate from kara + te(“Chinese” + “hand”) to kara + te (“empty” + “hand”). 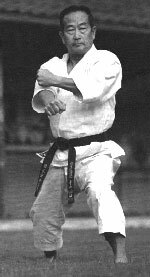 Then, in order to popularize the “local” Okinawan martial art in the rest of Japan, Master Funakoshi synthesized a complete system of techniques and theory, and changed the Chinese and Okinawan names of the kata into standard Japanese. In 1929, after much thought and reflection, he also changed the name of karate-jutsu(“Chinese-hand martial art”) to karate-do (“the way of karate,” or “the way of the empty hand”). He then defined the Twenty Precepts of Karate, and established a grand karate philosophy. 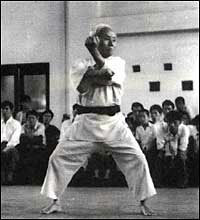 Carrying On the Spirit and Tradition of Funakoshi Gichin’s WorkMaster Nakayama Masatoshi had martial arts in his blood. Born in April 1913 in Yamaguchi Prefecture, he was a descendant of the Sanada clan, in the Nagano region. His ancestors were highly-skilled instructors ofkenjutsu (the art of swordsmanship). Upon entering Takushoku University in 1932, Master Nakayama immediately joined the university’s karate club, studying under Master Funakoshi Gichin and one of the master’s sons, Funakoshi Yoshitaka. Deciding to devote his life to karate, he traveled to China after graduation for further study and training. When he returned from China in May 1946, he got together with fellow Shotokan practitioners from his university days to revive the Shotokan karate tradition with Funakoshi Gichin as Supreme Master. Together, in 1949, they established the Japan Karate Association. In 1955 a headquarters dojo was built at Yotsuya in Tokyo. It spurred the building of JKA branch dojo all across Japan. The efforts of the Japan Karate Association to embody and promote the spirit of karate-do were highly regarded by the Ministry of Education (now Ministry of Education, Science, Sports, and Culture). In 1957, the Ministry granted the JKA exclusive legal recognition in Japan as an official association of members for the promotion of the way of karate. During that time and over the next several years, Master Nakayama made immeasurable contributions to the art. He developed, together with his fellow JKA instructors, a new, rational method of teaching that was tailored to the level and goals of each student: karate as a physical development tool, karate as a method of self-defense, karate for matches, etc. He also emphasized the necessity for each aspect of training to be physically and kinesthetically practical, and he scientifically analyzed how to make them so. Moreover, to ensure that the true essence of karate-do was being passed on correctly, he and his disciples established a two-year specialist instructor training program, which is still the only specialist instruction system in the world of karate. And the training never ends; the JKA is, and always has been, the only karate organization whose full-time instructors continue to get together every day for joint practice. Through this program, JKA instructors constantly endeavor to refine and perfect their karate. Master Nakayama also invented karate’s first match system: the first ever JKA All Japan Karate Championship was held at Tokyo Metropolitan Gymnasium in October, 1957—and was attended by so many participants and spectators that the venue was filled to capacity. His adaptation of kata and kumite for the match system was a huge success; the 5th JKA All Japan Karate Championship in 1961 was even attended by His Majesty the Crown Prince of Japan (now His Majesty the Emperor of Japan). Karate was growing increasingly popular throughout the world. 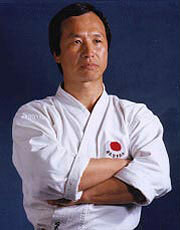 Master Nakayama passed away in 1987, at the age of 74. TORA is the Japanese name for tiger… it is also the nickname by which Keinosuke Enoeda of the Japan Karate Association was known during his fighting days in Japan. The J.K.A. is the organisation that represents the Shotokan style of karate, the most widely practiced style in Japan and throughout Europe, which has produced a great many famous instructors. Of this elite group, one man stands out for his tremendous fighting spirit – Enoeda ‘Tora’ is renown all over the world for his indomitable spirit and truly dynamic teaching style. A descendant of two famous samurai lines that date back to the Meiji period, Enoeda carries on the warrior tradition admirably. He was born in Fukuoka on the island of Kyushu in southern Japan on July 4th 1935 and practiced martial arts from an early age. Whilst his brother and sister played games, he, at the age of seven, began Judo. Continuing his training through his high-school days he regularly entered Judo competitions and was once runner-up in the All Japan High School Championships. At the age of 17, shortly after he gained his second degree black belt, he watched a demonstration given by two members of the Takushoku University Karate Club in Tokyo. He was won over and the sport of Judo lost a good up and coming player. Aside from any academic merits, Takushoku University was well known for its strong martial arts, particularly its tough karate section and this was Enoeda’s main reason for enrolling at the university. After two years training he passed his first degree black belt examination, and then two years later, aged 21, he was made captain of the karate club. It was during his university training that he received instruction from the great master, Funakoshi Gichin – the Okinawan who first introduced karate to Japan. After graduating in 1957 with a degree in commerce, Enoeda was invited to take the special instructors course at the J.K.A. headquarters. He accepted and for the next three years studied long and hard on a daily basis under Masatoshi Nakayama, the chief instructor of the J.K.A. and Hidetaka Nishiyama, a leading senior. 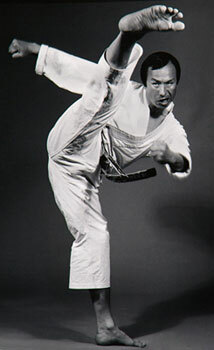 Always a keen competitor, Enoeda regularly entered the various tournaments and achieved several victories, including the East University Karate Championships. Then in 1961 he won third place in the kumite division of the J.K.A. All-Japan Championships and also finished high in the kata event. The following year he repeated his kata placing and moved another step up in the kumite by finishing second – losing to Hiroshi Shirai, a fellow J.K.A. instructor. Then in 1963, after another year’s hard preparation, Enoeda turned the tables on Shirai in the kumite final and became the All-Japan Champion, again being placed as a kata Finalist. In those days many credited Enoeda with possessing the strongest punch in all Japan, as a result of his tremendously powerful hip action and constant practise on the makiwara or striking board. Up until his 1963 triumph, he had only taught locally at the Tokyo Art College and a military university but this was soon to change. Among the spectators at that year’s championships was President Sukarno of Indonesia and so impressed was he with the strength and fighting prowess of the winner, that he made negotiotions for Enoeda’s services. Together with Master Nakayama, he spent four months in Indonesia teaching the President’s personal bodyguards and at the Police and military establishments. Following the J.K.A.’s expansionist policy of sending its best instructors out from Japan to spread Shotokan karate, Master Enoeda began his worldwide travels that were to culminate in his settling in Great Britain as the Shotokan Chief Instructor. He has also spent considerable time in South Africa and the U.S.A. and regularly travels throughout Europe spreading the karate gospel. By developing a countless number of fine Karateka and many leading champions in the art, Master Enoeda has been instrumental in making Great Britain one of the strongest karate nations in the world. He has also found time, over the years, to coach many celebrities for their ‘fighting scenes’ in films – Lee Marvin, Michael Caine, Sean Connery and Edward Fox – have all defeated their ‘enemies’ with his help, and leading actress, Ingrid Pitt has continued to train with him for many years now. Of all the top karate Sensei, Master Enoeda stands out. Of course he is one of the fittest, most powerful karate technicians but he has another, less definable quality. His energy and charisma – almost an aura – are something special. He has that ability to bring out the best in a student. He forces one to perform better karate – to kick and punch with more accuracy and power, to leap into the attack with gusto, to push oneself past previous self-imposed limits.